Thank you for your interest in donating food to help the many hungry families who benefit from our Food for Kids Program. Below are details, tips and tricks to keep in mind as you plan your service activity. Advertise your event on Facebook and other social media sites to help attract more potential donors. If it is a large event, local newspapers may write about it as well. No glass containers and no expired food please! Check the expiration date on every item, if you collected anything directly from participants (rather than purchasing directly from a grocery store). Take pictures during your food drive and share them with us by emailing them to marketing@volcenter.org! We may post these photo on social media, our website, etc., which is a great way to thank your participants and inspire others to get involved. Sort and count the food, If you have a lot of food and volunteers. It's not essential, but it is helpful. For larger donations, your donors/group can make arrangements to pack the food you collected into bags for the families. Contact us and we'll provide instructions for the sorting and packing - and the space if you need it. It’s a blast for adults and children alike! Otherwise, our Food For Kids volunteers will pack the food for the families, and then deliver the completed bags to the participating schools on Fridays. 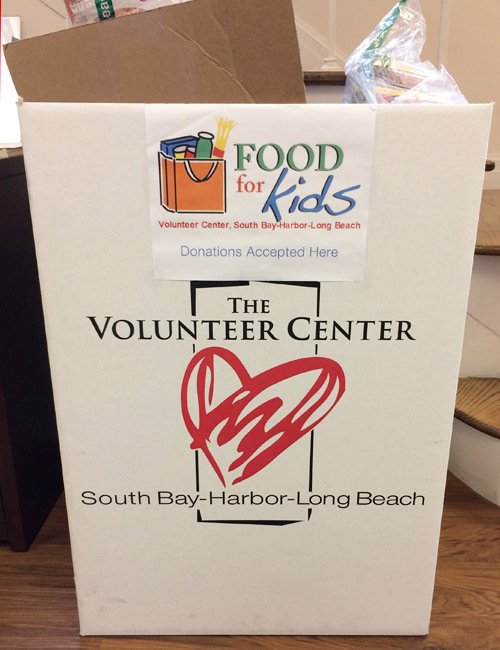 IMPORTANT: Please contact us ahead of time at info@volcenter.org or (310) 212-5009 to schedule a time to drop off the donations from your food drive. We will weigh the items and give you a receipt. We will also mail a thank you letter for donations valued more than $250, if you provide us the name and mailing address of the donor(s). 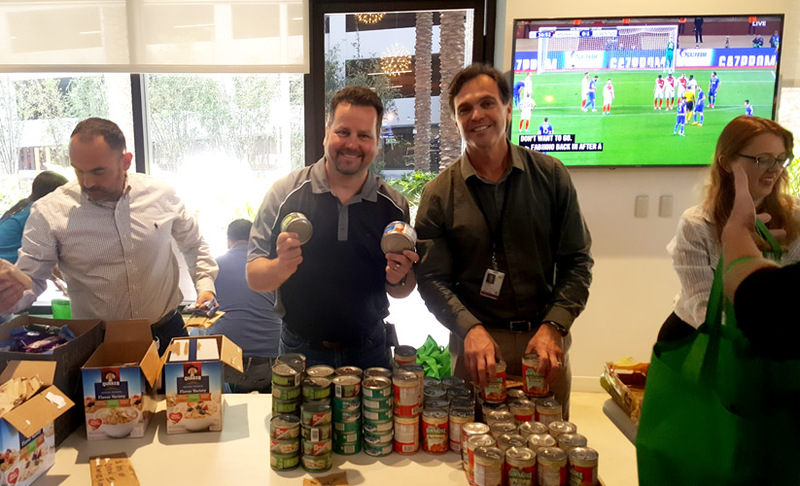 Ask your colleagues to form teams and bring non-perishable food items to a group meeting or collection container in a central location. Have competitions to see which team can bring in the most food as a fun team-building event! Put a Food For Kids collection box in your lobby. We will provide these boxes and they are great marketing tools that shows your commitment to the local community. Plan a company-wide "impact" day. Collect or purchase food from the Non-Perishable Food Shopping List. Then use our grocery bags or your own and have a blast packing as a group at your facility. You can also print out our nutrition flyers and add your logo or information to the insert card so your company/group is recognized for your hard work. Ask your group leaders to talk to grocery stores, and see if they will allow your group to request non-perishable food items from shoppers or if the store will ask shoppers to make direct donations to Food For Kids at checkout. We've found youth leaders do very well at this. We can also provide an official request letter if the stores needs it. On the day of the collection, plan to be there for about 4 or 5 hours. You can coordinate various shifts to split up the collection among your volunteers. We've found two hours shifts per person work the best for most adult and youth volunteers. The times we've found that yield the best results are Monday and Friday evenings OR Saturdays and Sundays between 10:00 a.m. and 7:00 p.m. Draw the shoppers' attention by setting up a table with sample items and info about both Food For Kids and your group. Wear your group's logo or school colors and distribute our Non-Perishable Food Shopping List to shoppers as the enter the store. You can add your logo to the flyer if you like. Be sure to have volunteers who are able to lift heavy boxes available at the end of the event to help pick up all the food collected. Plan a group event to collect food, and then pack the bags at your venue or ours. Contact us for instructions on sorting and packing! If you are holding an important meeting or a special event, consider asking attendees to bring a can of food. For example, if you throw a fashion show, birthday party or fundraiser, charge your normal price for admission, plus one can of unexpired food. Have cans ready to "sell" to attendees who forget. 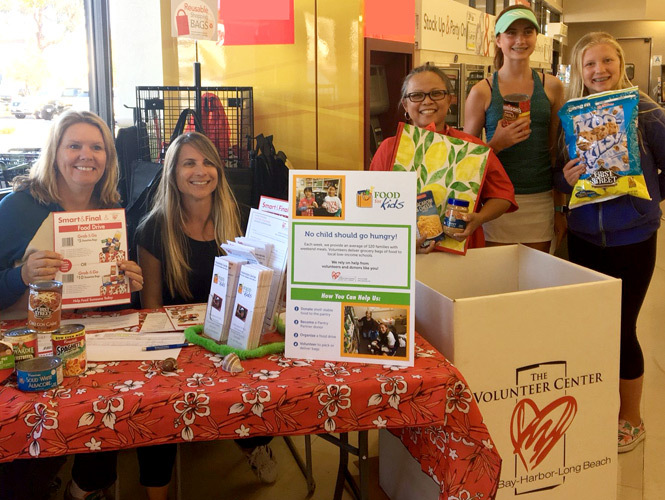 If you would like to "adopt-a-week" (about 120 bags of food or about 1,200 items), you can pack it all at the Volunteer Center. We provide the bags and nutrition inserts, and your group has all the fun! Schools can hold food drive competitions between classes, grade levels or schools. Teach children how to help the local community in a manner that re-enforces your family’s values. For example, every time you take your children grocery shopping, have them pick one item to donate. After you accumulate a full box, bring the children and the box to the Volunteer Center for a tour. Tours can be scheduled Monday through Friday between 8:30 a.m. and 4:00 p.m. by contacting us at info@volcenter.org or (310) 212-5009. From family celebrations to yard sales, encourage people to "pay" for items or celebrate by donating cans of food. We've found this is a fun addition and people appreciate your thoughtfulness. Extend the Lesson in Empathy and Kindness: Read The Berenstain Bears and the Joy of Giving, Maddie's Fridge, or another book on our list of Books About Kindness and Helping Others to assist with the lesson in empathy and kindness. Please contact us at info@volcenter.org or (310) 212-5009.